Research shows that self-awareness – knowing who we are and how others see us – is the foundation for high performance, smart choices, and lasting relationships. There’s just one problem: most people don’t see themselves quite as clearly as they could. 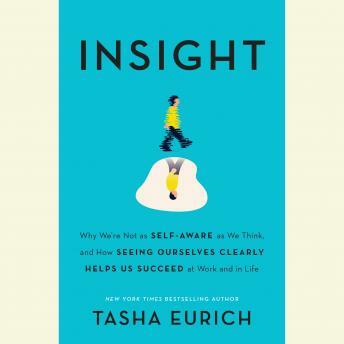 Fortunately, reveals organizational psychologist Tasha Eurich, self-awareness is a surprisingly developable skill. Integrating hundreds of studies with her own research and work in the Fortune 500 world, she shows us what it really takes to better understand ourselves on the inside - and how to get others to tell us the honest truth about how we come across. Through stories of people who’ve made dramatic gains in self-awareness, she offers surprising secrets, techniques and strategies to help readers do the same – and how to use this insight to be more fulfilled, confident, and successful in life and in work. * The 7 types of self-knowledge that self-aware people possess. * The 2 biggest invisible roadblocks to self-awareness. * How to stop your confidence-killing habits and learn to love who you are. * How benefit from mindfulness without uttering a single mantra. * Why other people don’t tell us the truth about ourselves – and how to find out what they really think. * How to deepen our insight into our passions, gifts, and the blind spots that could be holding us back. * How to hear critical feedback without losing your mojo. * Why the people with the most power can often be the least-self-aware, and how smart leaders avoid this trap. * The 3 building blocks for self-aware teams. * How to deal with delusional bosses, clients, and coworkers.